Grandpa says circles are all around us. We just have to look for them. He and his granddaughter meditate on gardens and seeds, on circles seen and unseen, inside and outside us, on where our bodies come from and where they return to. They share and create family traditions in this stunning exploration of the cycles of life and nature. We provide innovative ways to bring the concepts expressed in All Around Us to your classroom. Here are a few workshops we have to offer. 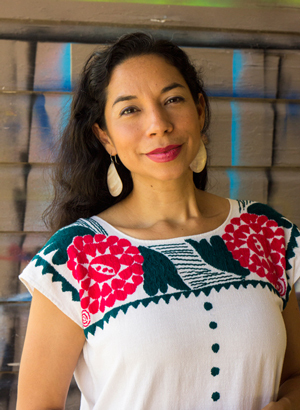 In this unique and dynamic program, Xelena will follow a reading of her book All Around Us with a movement-based retelling of the tale. 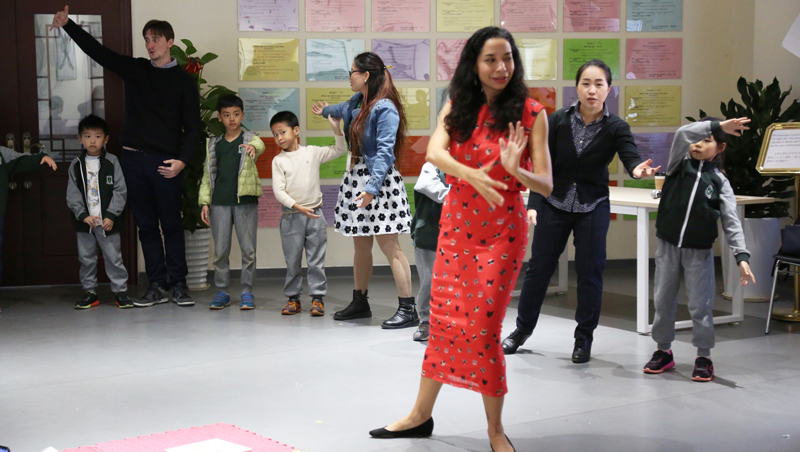 Drawing upon her experience living in China, she will introduce participants to the basics of tai chi in a way that will make the story meaningful and unforgettable. Time permitting, participants will then engage in a group story circle that will involve their own ideas and movements inspired by tai chi, yoga, or other forms of expression. 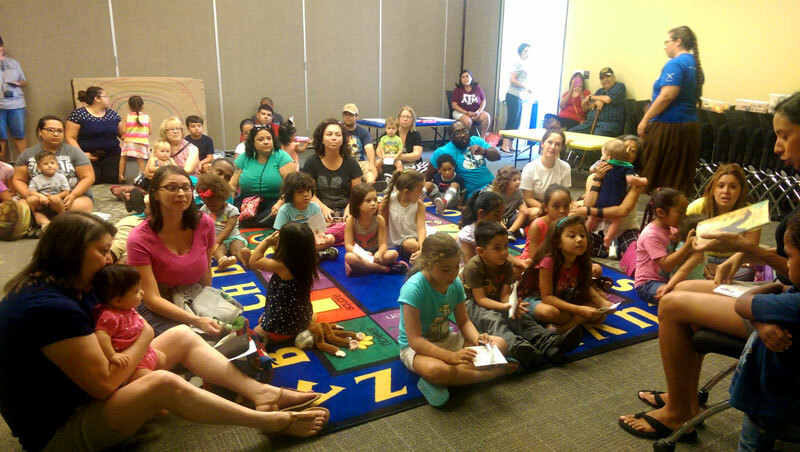 This program is appropriate for ages 5 to adult, and can be modified for younger audiences with parent participation. 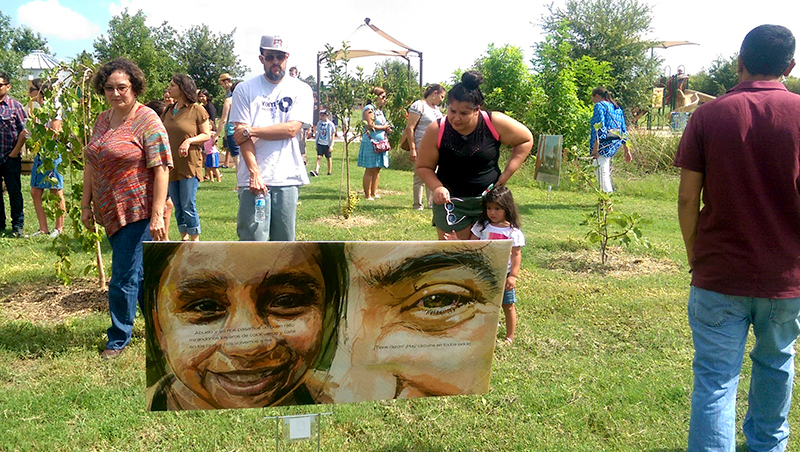 Also in conjunction with the San Antonio Public Library, Xelena and Adriana shared an early version of the book with their community through a dynamic reading and art installation, designed in the style of a Story Walk. This unique way of sharing stories promotes family literacy, healthy living, and nature appreciation. Please contact the creators to discuss the space and cost considerations involved in replicating this exhibition in your space or city. Indoor or outdoor displays are possible. 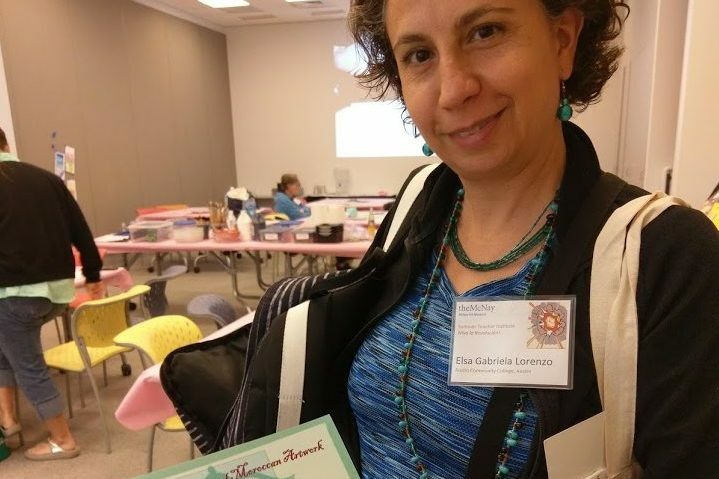 This workshop asks participants to go within and reflect upon their own unique gifts. We will connect with images from nature as we build a poem that may play with metaphor, simile, or personification. Adding illustrations to our creations will enhance the experience and the final piece can be designed on a single page or in “mini book” form. If time allows we will extend the poem into expressive movement with a focus on mindfulness and positive affirmations. 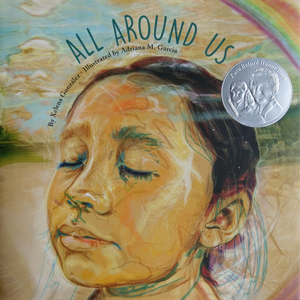 Get to know the author and illustrator of All Around Us. 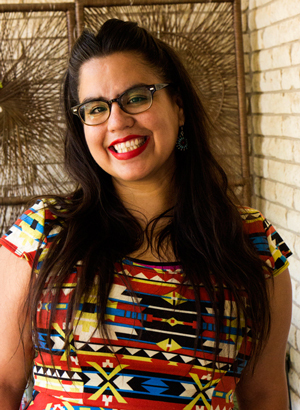 Xelena González has roots in San Antonio, Texas and is an accomplished journalist and dancer who has led various workshops in creative writing, world dance, and interdisciplinary arts. She studied journalism at Northwestern University and library science at Texas Woman’s University, but her true training as a storyteller has come from getting to know other living beings—including plants, animals, and people who happen to speak different languages or see the world in unusual ways. She tells these stories through picture books, essays, song, and dance. Take a look at what they are saying about All Around Us. Dear teachers of #STEM & #STEAM do you have ALL AROUND US in your collection yet? This is one of the most gorgeous odes to math, culture, art, and science I have ever read. @5puntosbooks Circles, life cycles, ecology, intergenerational relationships, Native ways of knowing - how can one #PB hold all this? I'm in awe of Xelena González's words & @adrianamjgarcia beautiful illustrations. Yes! There is so much packed into this little book. I feel like it belongs in ALL the sections! I'm seriously amazed - how does one book manage to accomplish so much? I love this book -- from the striking illustrations, to the theme of the cycle of life and death, to the lovely relationship between grandaughter and grandfather. Beautiful in pacing, in quiet but thoughtful scope, and a good, healthy introduction to the idea of birth and loss. Just lovely. Not everyone sees life and time as linear as portrayed in this genuine and tender conversation between a grandfather and his granddaughter as they explore the significance of the circle both in their immediate day but also the history of their family and culture. An authentic voice of perspective. This philosophical offering opens with a young girl and her grandfather searching for circles. . . . The colorful illustrations at once capture the intimate bond between the girl and her grandfather, and suggest movement and vitality with bold, sweeping arcs and energetic lines. VERDICT This quiet, thoughtful offering is ideal for readers seeking to explore cycles in life and nature or familial bonds and traditions. Best shared one-on-one. It is beautiful. I answered the phone just as I closed the book. I couldn't say hello for a couple of seconds because I had tears welling up. Let us know what you think of All Around Us and if you are interested in bringing one of our workshops or story walk to your organization. We've visited 12 cities promoting All Around Us and giving workshops. Check out what we've been up to! We are booking visits and might be in a town or school near you! 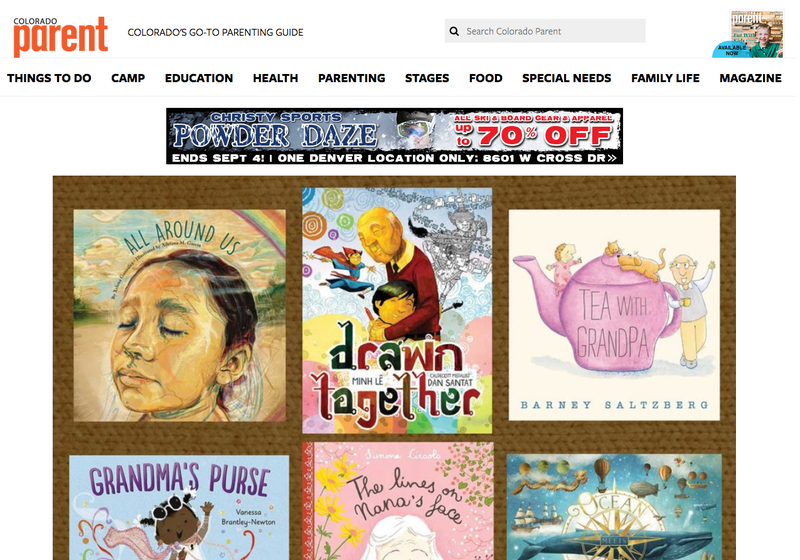 Look who's book made it on the Colorado Parent list that gives a shout out to Grandparents!!! Posters and Bookmarks are now available at the ALA bookstore! Hot off the presses American Librarian Association just made available Bookmarks and Posters get one today for your center or classroom to promote multicultural reading! 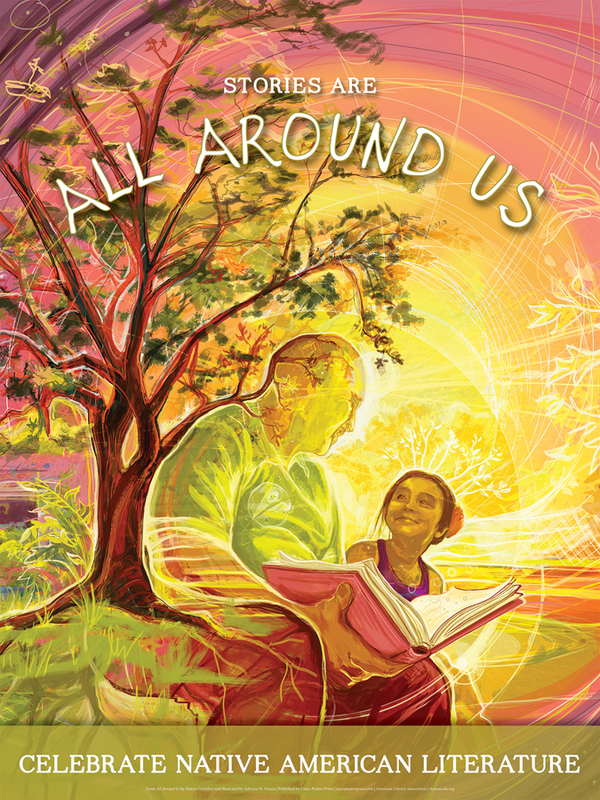 Dreamscape Media produced an animated audio book of “All Around Us” check it! Check out Dreamscape Media who made the illustration come alive with movement! We were honored to be apart of this teacher development at one of the most beautiful Museums in San Antonio. We shared literary and art workshop ideas and learned from teachers form all across the city.